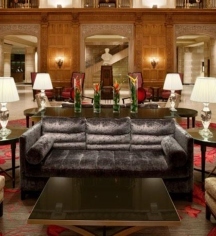 As one of Canada’s most recognizable landmarks, Fairmont Château Laurier offers an experience few can rival. Stationed in the center of Downtown Ottawa, this recently renovated hotel was built to resemble a Renaissance-era French château. Though located in Canada, the mastermind behind the hotel’s inception was an American named Charles Melville Hays. Unfortunately, Hays perished in the sinking of the Titanic just weeks before his dream hotel opened in June 1912. Featuring 426 revitalized guestrooms, including accessible suites, Fairmont Château Laurier offers visitors to Ottawa a fresh, regal elegance. The plush Sealy mattresses offer a luxury sleep experience that will leave guests feeling rested and refreshed for the day ahead. Every accommodation includes HDTVs, WiFi, cozy bathrobes, Nespresso coffee makers with complimentary coffee and tea, and windows that open for fresh, Canadian air. For guests who benefit from accessible features, eight rooms are equipped with special accommodations like lower light switches, wider doorways, and support bars. To enhance the experience, Fairmont Château Laurier provides visitors with a health club that features a pool and workout equipment, massage therapy, and nutritional counseling. There are three restaurants on-site, and over 15 meeting rooms and venues for conferences, event launches, and weddings that accommodate up to 800 guests. Explore the rich community where the Fairmont Château Laurier calls home. Ottawa has various festivals, enlightening city tours, exciting winter sports, and a world-renowned orchestra. 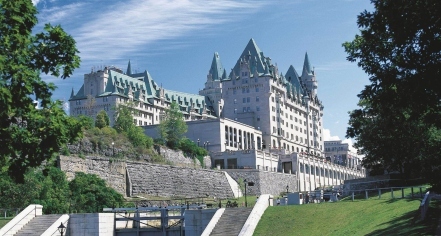 Located in the center of Downtown Ottawa, Fairmont Château Laurier is just minutes away from exciting attractions and activities. Guests can explore the best that Ottawa has to offer, from the historic Rideau Canal that cuts through the city to museums such as the Canadian Museum of History and the National Gallery. As the capital of Canada, Ottawa is also an excellent location for business meetings and professional conferences, as well as romantic weddings and getaways. The Fairmont Château Laurier was one of the first hotels to provide indoor plumbing to guests. Extra Person Fees: Fees vary; please notify request at time of booking. Parking: Valet parking is available at a daily rate of $45.00 CAD, with in/out privileges. Pet Policy: $50.00 per pet, per day; dogs and cats up to 25 lbs. only; only two per room. Learn more about the History of Fairmont Château Laurier .